SyntecOptics.com is your one stop shop for opto-mechanical components, assemblies and sub-assemblies required for your custom optics applications. After CNC turning is completed, pieces are finished with a black anodized layer and a surface finish of 16 RMS, and then assembled, with an overall final length of 24.059″. We work from a customer supplied print, and perform in-process testing and quality control requirements determined by Quality Supervisor. 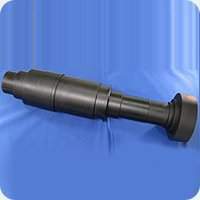 This piece is an excellent example of our CNC turning, custom optics machining and assembly expertise. For more information on our capabilities, please contact Wordingham Technologies today.